There was a time when the deity of Jesus was the stumbling-block to salvation for some, yet it was safe to assume they believed in God. Today we can assume nothing. And the questions about life that people have are bigger: Who are we? Where did I come from? Is there a God? And if so, does this God care about what's going on in my life? David Helm and Jon Dennis believe that the answers are found where Christianity began. Not in the Gospels with the person of Jesus, but rather back in Genesis with the introduction of God and His work in the world. Based on conversations they've had with university students they pastor, Helm and Dennis have written a book for all who have a healthy uncertainty about life's big questions -- those who while knowing many things, reserve a measure of doubt on most everything. Using the Socratic method, the authors challenge readers to wrestle first with the text of Scripture itself rather than with systematic questions. The authors' hope is that through a candid conversation with Genesis, curious readers will find the answers they're seeking. - Publisher Here is a book for all who have a healthy uncertainty about life's big questions--Where did I come from? Is there a God? Does this God care about me? The authors believe that the answers are found where Christianity began--with the introduction of God and His work in the book of Genesis. Using the Socratic method, they challenge readers to wrestle with Scripture itself rather than with systematic questions. This candid conversation with Genesis is an ideal apologetic for today's postmodern culture. 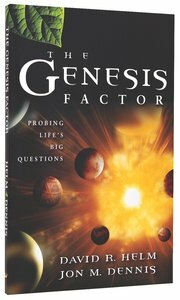 About "The Genesis Factor: Probing Life's Big Questions"
Here is a book for all who have a healthy uncertainty about life's big questions--Where did I come from? Is there a God? Does this God care about me? The authors believe that the answers are found where Christianity began--with the introduction of God and His work in the book of Genesis. Using the Socratic method, they challenge readers to wrestle with Scripture itself rather than with systematic questions. This candid conversation with Genesis is an ideal apologetic for today's postmodern culture. David Helm is Sr. Pastor of Holy Trinity Church, a multi-congregation Reformed Church in Chicago. His pastoral duties are primarily focused in vision casting, preaching, and writing. He earned a BA from Wheaton College (in Communications) and he was ordained in the PCA after graduating from Gordon-Conwell Theological Seminary in 1988. He authored the Big Picture Story Bible and co-authored The Genesis Factor. In addition to his duties at Holy Trinity Church, David serves as the Executive Director of the Charles Simeon Trust. His current writing projects include a commentary on I, II Peter and Jude (Preaching the Word series).